Settled right in the heart of Bhuj, this artificial lake is a pleasant welcome for travelers who wish to take a break from their travel schedule. This artificial lake is said to be 450 years old. 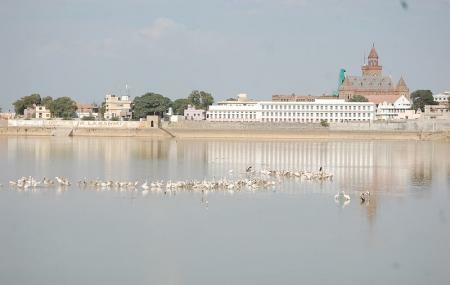 It was built to meet the water requirement of Bhuj. Today , the lake has turned into one of the hotspot for locals and outsiders for picnic and take rest under the shaded trees that borders the lake. During summer, people enjoy swimming in the cool water of the lake. If you are looking for a place to enjoy a peaceful morning or evening walk in the city, this lake is the ideal spot for you. As you walk along the lake, you can see Aina Mahal, Prag Mahal, Sharad Baug palace and Kutch Museum, located on the other side of the lake. You can visit the lake any time of the day. By hired auto or car. How popular is Hamirsar Lake? People normally club together Rann Utsav and Matanamadh while planning their visit to Hamirsar Lake.